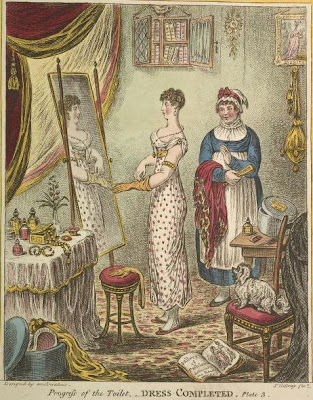 In 1810, British caricaturist James Gillray created a series of engravings titled Progress Of The Toilette, showing how a Regency lady would get dressed for the different engagements she had to attend throughout the day. 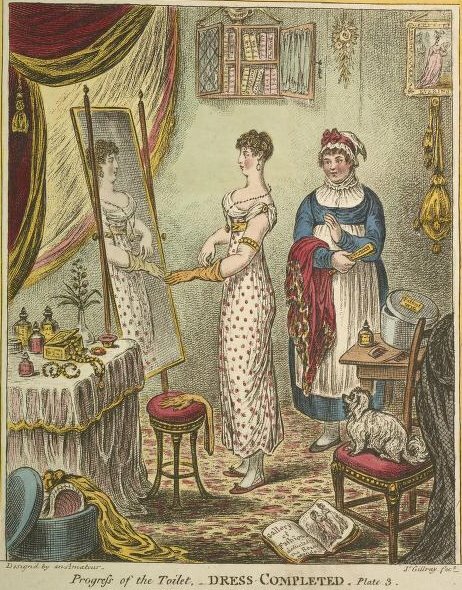 There are so many details in these pictures, giving us an accurate insight about the time a lady spent at her toilet, how she prettified herself and what fashions were popular at the time. Let’s take a closer look at them, shall we? A young lady has just started her toilet with the help of her maid. She’s still in her underwear, and has her stockings on. On her head, she wears a cap, while on her feet a simple pair of slippers. 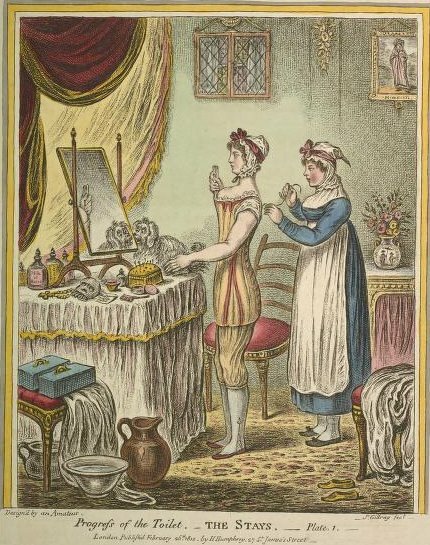 While the maid is tightening her stays, the girl is placing a busk (a piece of wood that was inserted down the front of the stays to ensure good posture), between her breasts. The busk seems a little instrument of torture, but if you managed to tighten the stays enough to make it stay put, it was quite comfortable. 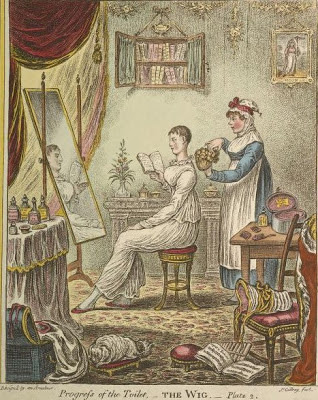 On her dressing table, we can see her jewelery, pins and all the different concoctions used by Regency women to beautify themselves, while on the floor there are a bowl and a pitcher with water, which were used for morning ablutions. Usually, people back then would wash only their hands and their faces. It’s now time for the young lady to put on her hair. While she’s sitting in front of a mirror reading a book, her maid prepares to place a short, curly wig on her head. Wigs at this time were quite simple, often short, and very different from the powdered and elaborate styles that was popular in the previous century. The lady is wearing a simple white muslin gown, which was a very popular daytime during the Regency. It’s now evening and the lady is about to go out. She’s wearing a sleeveless white dress embroidered with gold and is putting on her gold evening gloves. Her maid stands aside, ready to hand over to her mistress her shawl and fan. She may keep the latter, until she arrives to her destination where she’ll use it to cool herself down and flirt, in her reticule (a small bag with a drawstring) that’s now hanging on a hook on the wall. For her outfit, she has probably drawn inspiration from the fashion magazine now discarded on the floor. What do you think of these engravings? And do you like Regency fashions?